This is one of our families favorite recipes. I make this all year round even with our summer heat, because we start to miss it. Lol! This chili is great by itself, with all the toppings, served on a loaded baked potato, or however you like to eat your chili! But I have to warn you, there is secret to this recipe.... And I must really like you all if I'm willing to share it with you. hehe! Oh ok... The secret is Chocolate!! Yup, I'm serious. Trust me it really is good. My dad is the first person who introduced me to chocolate in chili and I remember the first time he made it I was pretty skeptical. I mean chocolate in chili? It sounds a little weird, and I know a lot of people who simply won't even give it try because of that. Though my favorite thing is after guests eat it, and rant and rave over how delicious it was, we tell them the secret ingredient and then they all SWEAR they could taste it... haha! That cracks me up every time because you really can't, there's not a lot in it and it just brings out the other flavors. Ever seen the movie Chocolat'? It's the same concept the shop owner had with her chocolate and hot chocolate, just a little chili powder brings out the flavor of the chocolate, and guess what, the reverse is true too! The original recipe I made had 1 pound Ground Beef, and 1 pound Italian Sausage, I changed it to Ground Turkey to cut out most of the fat. It's a big hit in our family, and it also freezes very well! This can also be done on the stove top if you're short on time just cook in a 8 quart stock pot. This recipe does require a 6-8 quart crock pot. Heat the oil in a skillet over medium heat. Add the onions and garlic and cook, stirring occasionally, until tender, 7-10 minutes. Stir in chili powder, paprika, cumin, oregano and salt. Add the Ground Turkey (or ground beef & sausage). Increase the heat to medium high and cook the meat, stirring frequently, until cooked through, 8-10 minutes. Once the meat is done add to the crock-pot. Add the Tomatoes, Kidney, Chili and Black Beans, and the chocolate into the crock-pot and stir. Cook on low for 6-8 hours, or on high for 4 hours, stirring occasionally if possible. (If done on the stovetop, cook on low heat, cover and simmer, stirring occasionally, for 1 hour.). Top with your choice of toppings, and enjoy! This is a family favorite in our house. We all love it, and eat it like mad when I make it! It's great served any way you like it, including on a loaded baked potato! I typically only make it during the winter months. But I'd still say it's a 4.5 star recipe! I love dark chocolate in chili! It also goes great with chipotle! Its a discovery for me, choc in chili and why not with a good taste. 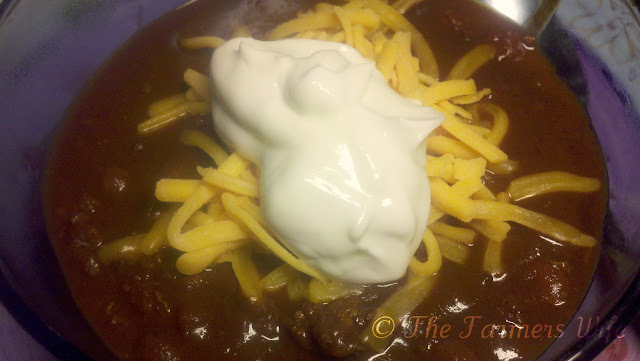 Chocolate goes so well in chili! My brother swears it is secret ingredient! Oh my mouth is watering! This sounds so good. Here in Sweden they don't make chili, so I am so excited to knock their socks off with this one! Thanks for sharing! Girrrrrl... that's just downright delicious!! I've never thought to try chocolate in chili. I must give this a whirl.